Nitrification consumes large amounts of oxygen. For every lb of BOD oxidized, 1 lb of O2 is used. For every lb of ammonia oxidized, 4.6 lb of O2 are used. In order for uninhibited nitrification to occur, a working DO level is 2.0 mg/l is suggested. Nitrifying bacteria do not compete well against heterotrophic bacteria for D.O. and nutrients. Before nitrification can take place, the soluble BOD must be sufficiently reduced to eliminate this competition, generally down to 20-30 mg/l. This condition is easily achieved in the final cells of a lagoon system. The longer detention time, the more likely nitrification will occur. 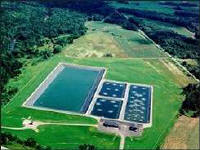 Activated sludge plants are able to nitrify in 6 - 48 hours. lagoons may have detention times of 30 days or longer. Nitrification is enhanced at higher pH's. 7.5 to 8.5 is ideal although nitrifying bacteria can adapt outside of this range. Nitrification produces acids. Alkalinity is also consumed at a rate of 7.14 lbs CaCO3 / lb NH3 oxidized. Sufficient alkalinity must be present to buffer the acids produced during nitrification. 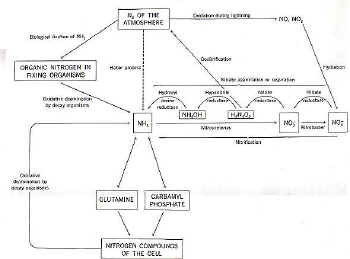 The arte of nitrification is greatly influenced by temperature. As the temperature increases, the nitrification rate increases. Temperature of greater that 20C up to about 35C enhance nitrification. Nitrification slows down dramatically or may stop altogether at around 5 degrees C. lagoons get down to ) degrees C.
A sufficient population of nitrifying bacteria must be present in order to nitrify. These bacteria are attached growth organisms, meaning that they must attach themselves to the surface of an object. In an activated sludge plant, the surface is a floc particle. In a trickling filter or RBC, the surface is the artificial media. Many people think that lagoons do not nitrify to any significant degree because lagoons do not have a high mass of solids under aeration for the nitrifiers to attach. It is believed that nitrifiers may attach to side slopes, baffles, and perhaps algae particles. Nitrifying bacteria are more sensitive to inhibitory compounds such as heavy metals that are the BOD reducing bacteria. The nitrifying bacteria would be the first ones to die off. 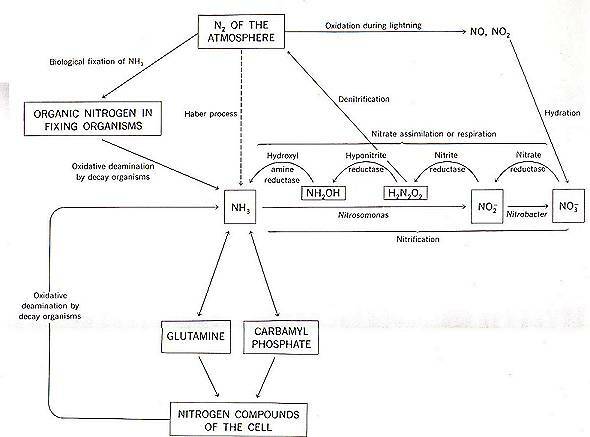 Ammonia N (NH3-N) - Inf and eff - If substantial nitrification is taking place you would see a significant decrease. Nitrite(NO2) - Eff-generally <.5 mg/l, anything greater would be considered high. Alkalinity (measured as CaCO3) Inf and Eff - Expect a significant decrease if nitrification is taking place. Effluent concentrations <50 mg/l indicates potential for pH problems. High BOD's can result if nititrfication is taking place within the lagoons and there is enough residual ammonia remaining in the effluent. When you collect an effluent sample and set up BOD's, you are adding any nitrifying bacteria that may be present in the effluent to the BOD bottle. They may feed upon the remaining ammonia and thus use up D.O. in the process, which will show up as an elevated BOD. Effluent BOD's have been reported as >80 mg/l under these circumstances. If this is suspected of causing long term problems, perform and inhibited BOD test by adding nitrification inhibitor. 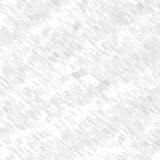 The results of this test are referred to as the carbonaceous BOD, or CBOD. The inhibitor stops the nitrifiers from feeding on the ammonia. The CBOD should be considerably lower than the BOD if nitrification is taking place and will be a more reliable indicator of how the plant is functioning. The CBOD cannot be used for reporting purposes unless it is specified in your permit. Low effluent pH's may result if there is insufficient alkalinity present to buffet the acids produced during nitrification. Remember nitrification also used up alkalinity. 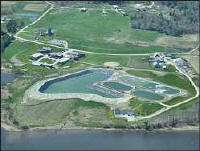 There should be at least 50 mg/l of alkalinity remaining in the effluent to prevent low pH problems. If this is a long lasting problem, alkalinity may need to be added to the system. Nitrite can sometimes accumulate within the process due to the slowing down of the nitrite forming bacteria. This may happen during the spring and fall due to temperature changes. Nitrate formers are more temperature sensitive. Nitrite has a high chlorine demand. 5 parts of CL2 are used up for every part of NO2 oxidized to NO3. Under normal conditions, NO2 levels will be minimal, from 0-5 mg/l.